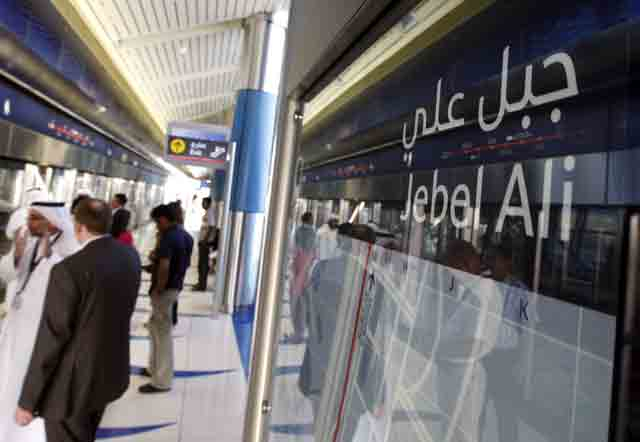 Dubai: Jebel Ali Station on the Red Line of the Dubai Metro was opened on Friday, much to the delight of thousands of employees working in the Jebel Ali Fee Zone Authority (JAFZA). The station will mainly serve people working or living in JAFZA as passengers who do not have JAFZA entrance passes will not be allowed to get off the station. So far there is only one entrance and exit of the station and passengers will have to use the Metro bridge to cross Shaikh Zayed Road from JAFZA. “We will have another entrance on the other side once the road work is completed,” said Ramadan Abdullah, Director of Operations at the Rail Agency of the Dubai Roads and Transport Authority (RTA). He said the station would mainly serve the people working or living in JAFZA as those who do not have access pass to enter JAFZA will not be able to access the station. The RTA has also introduced feeder bus route number F54 to link the station to different areas of JAFZA on both sides of Shaikh Zayed Road. “We expect around 4,000 passengers from this station every day,” said Abdullah. With the opening of the station, the train run time has increased to 109 minutes. Now, all trains will run full length of the 53km long Red Line of the Dubai Metro between Al Rashidiya Station and Jebel Ali Station. Jebel Ali Industrial area houses around 6,600 companies employing more than 129,000 people. Some 40,000 employees also live in the staff accommodation within the free zone while thousands of others commute daily from Dubai and Sharjah to their work places. Two other stations, including the Energy Station and Jebel Ali Industrial Stations, will be opened in future depending on the demand of passengers. Jebel Ali Station is the only stations, which has been built on ground while all other stations are either elevated or underground. It measures about 132 meters in length and 29 meters in width and has a total capacity of handling 11,000 passengers per her per direction. With the addition of the new station, the RTA now operate 27 trains in the morning peak hours and 29 trains in the evening peak hours to accommodate expected huge increase in the number of passengers. Abdullah also advised people to use the Nakheel and Harbour Station next to Ibn-e-Battuta Station for ‘park and ride facility. “We have parking facility for around 2,700 cars only a couple of hundred parking lots are taken every day,” he said. Parking is free for duration of 24 hours for the Metro passengers at the parking lots at Nakheel and Harbour Station and Al Rashidiya Station. In 2010 the metro has carried 38.888 million passengers and the current daily average of the metro ride is more than 149,000 passengers per day.